The Sunroom Bench | Yobot Inc.
Moving over to the sunroom/family room/dining room – or the all-purpose room, as we call it. This is the room that’s just off the kitchen of the new house, and we’ve placed a bench under the sunroom windows. 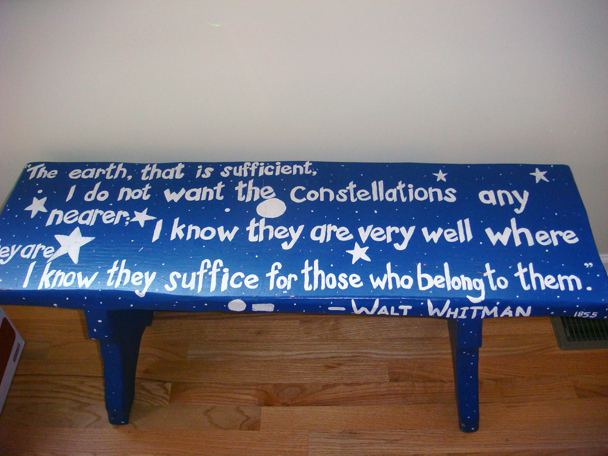 I’m proud to say that I hand-painted this bench after reading this poem by Walt Whitman. I painted this about 12 years ago, but it’s held up to daily abuse well, and we use it a lot. The bench was given to me by my parents – thanks Mom & Dad!